Franz Schubert was a gifted composer who died tragically young. 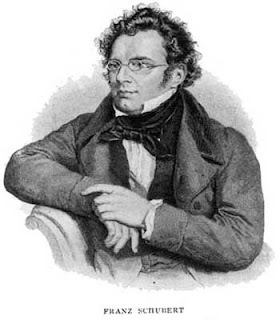 Easily considered among the "greats" of composers, Schubert contracted syphilis in 1822 at the age of 25. He continued to compose, even as his health deteriorated. Many say that the works of his last 2 years became very dark, showing a deeper sense of spiritual awareness, and even a sense of the "beyond". Stay away! Oh, stay away! I am still young, please go! Give me your hand, you beautiful and tender vision! I am a friend, and come not to hurt you. You will sleep softly in my arms! This theme of Death and the Maiden is seen in art as well as music. Usually death is portrayed seducing or tempting a beautiful maiden. The idea that death would be a temptation began earlier in the 1400's when death was portrayed in the Dance Macbre, playing an instrument, luring people to death. Perhaps if Death was a temptation, then humankind could avoid the temptation, and avoid death? Death and the Maiden as a theme also conjures up a feeling of vulnerability in youth, as well as beauty. It leaves us with the feeling that life is fleeting, as beauty can be. Schubert did an interesting thing. In 1824, a few years after his syphilis diagnosis, as his own mortality became central to himself, he re-worked his original Death and the Maiden lied into a string quartet. The theme, while similar to the original lied, takes on a very agonized and at times urgent tone. We might surmise the urgency he himself felt as he became more ill.
Second, here are two short videos I've done from the later string quartet. You'll notice the words from the original lied placed in the video, as well as suggestions to what you're hearing. The first is the maiden and the second Death answering. Hopefully you'll appreciate the dramatic difference in the earlier lied and later quartet and notice that the theme of "Death and the Maiden" took a very personal turn for Schubert. A few short years later Schubert did die. He was only 31. It is believed he died from complications for syphilis, though some believe he may have died from mercury poisoning, which at the time was the standard treatment for syphilis. As I read this post I was reminded that the fourteenth century was loaded with death for the Europeans: the plague, interminable war, death in youth was more assured than life, in that century. Thus, it seems logical, I think, that on its heels the Danse Macabre should be created. I've thought that it may have had something to do with a sense that one must accept the constant presence of death, even dance with it, rather than that one could avoid it as one avoids a temptation...but yours is an interesting consideration which hadn't occurred to me. It also seems appropriate, considering that European life wasn't particularly secular, at that time.